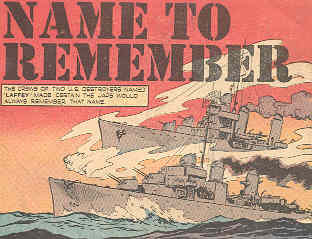 "Name to Remember," a five-page story in the Winter 1945 issue of True Comics, tells the battle history of two destroyers named Laffey. During a large naval battle off Guadalcanal in November 1942, the first destroyer sank after fighting a Japanese battleship at close range. A new and larger destroyer named Laffey was commissioned later in the war. This ship fought off many kamikaze planes for nearly two hours on April 16, 1945, and made it back to the U.S. under her own power despite being hit by several of them. Parents' Magazine published True Comics from 1941 to 1949 as an educational alternative to the superhero comics so popular at that time. True Comics had the following slogan on the front cover of each issue: "TRUTH is stranger and a thousand times more thrilling than FICTION." The comic book had monthly issues, except when government paper rationing forced the publisher to reduce its frequency to quarterly and its size from 64 to 48 pages. Most of the comics ran three to five pages, and they covered a wide variety of heroic individuals and historical events. Although World War II had already ended when the Winter 1945 issue came out, two stories in addition to the one on Laffey covered war topics: "Who Raised the Flag at Iwo Jima?" and "Flying Old Man" about Major John C. "Pappy" Herbst. As evidenced by True Comics' advertisements, this comic book targeted boys from ages 8 to 15. The comic's last frame states, "The saga of the Laffey's two hours of heroism and agony is one of the greatest sea epics of the war." The U.S. Navy publicized Laffey's fighting off kamikaze planes by displaying the ship to the public for five days in Seattle in late May 1945 and having the ship's commander appear on a nationwide radio program, We the People. The ship's story also became the subject of a short publicity documentary and several magazine and newspaper articles. Although this short comic captures the excitement of the final battles of the two ships named Laffey, the story provides only a few details. Some statements are inaccurate or misleading. 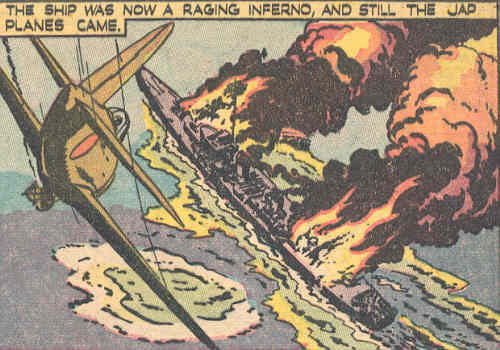 The comic shows the first Laffey launching torpedoes against a Japanese battleship, which explodes in flames when the torpedoes hit. In actuality, the torpedoes bounced harmlessly off the nearby battleship since they did not run a sufficient distance to activate the arming mechanism . One Laffey crewman in the comic says during the battle, "We've polished off two destroyers and a cruiser!" The comic implies that Laffey sank these ships during the battle, but this never happened. The statement possibly refers to battle action during the previous month (October 1942), when Laffey and two other American destroyers joined together to sink a Japanese cruiser and destroyer and damage another cruiser . According to the comic, the second destroyer Laffey was commissioned one year later in November 1943. However, the ship did not actually get commissioned until February 1944, although it was first launched in November 1943. Seven suicide planes hit Laffey out of the total of 22 planes that attacked the ship , but the comic does not provide any numbers. The comic states that Laffey "fought on until the last Jap plane had crashed or fled." This implies the planes fled because of Laffey's gunfire, but in the actual battle only one Japanese plane got away after dropping a bomb on the ship . This comic story about the two destroyers named Laffey presents a brief overview, along with drawings depicting battle action, of these two heroic ships. However, the story provides skimpy details, with some being incorrect or misleading. Becton, F. Julian, with Joseph Morschauser III. 1980. The Ship That Would Not Die. Missoula, Montana: Pictorial Histories Publishing Company. Dictionary of American Naval Fighting Ships. 2006. Laffey. Sumrall, Robert F. 2001. USS Laffey (DD-724). Somerset, MA: Tin Can Sailors.